Councillor John Cox is pictured at Banff bridge. A Banff riverbank which is disintegrating due to high water levels has sparked concerns it could impact on a north east route. On the Banff side of the River Deveron, a path, which runs along a grassy area between the B9142 and the river, has been wearing away. Worries have been voiced as similar erosion was found at the private Palmers Cove car park on the Macduff side of the river which resulted in its closure a few years ago. As a precaution, council landscape staff have removed the existing bench seat which was close to the edge. 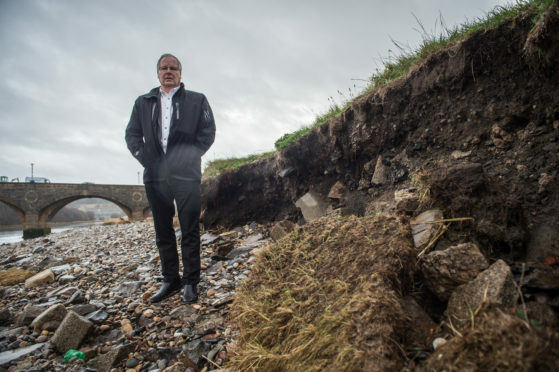 Councillor John Cox has raised concerns about the future of the area if the escalating level of erosion continues. He said: “There’s no immediate hazard, but we saw what happened with the car park on the other side, so there’s concern we could lose some land if it continues. “If the river keeps rising like this and causing this level of erosion, it could end up affecting the road outside the Co-op as well. “The river has been high lately and has been changing directions too. The car park at the Palmers Cove on the Macduff side of the River Deveron was closed several years ago due to similar problems. There is currently no risk to the public car park or the road on the Greenbanks side although Mr Cox worries this could be a future possibility. He said: “I’ve spoken to the roads department and had officers there, so the council are looking to do something about it. “My suggestion was to take away the seat – there was a bench along the ledge. “I’m worried about the loss of the amenities – we don’t want to lose the bench completely. The car park was a very popular amenity and had to be closed off. An Aberdeenshire Council spokeswoman said: “Our coastal protection and landscape teams are currently working together to consider options for the protection of the area but at this stage no funding has been identified for any works. “In the meantime, the council would urge the public to take appropriate care when walking in the area between the car park and Banff Bridge.